The Bachelor of Applied Psychology with Honours, the Bachelor of Business Management with Honours is a four-year double-degree programme. Applicants can apply for admission to Year 1. This programme aims to strengthen students’ knowledge and skills in both applied psychology and business management. By taking this double-degree programme, they can better understand the behaviour of individuals in groups and diverse work settings using a psychological perspective, and enjoy the competitive edge thereby developed when they enter the working world. Upon completion of the programme with satisfactory results, students are eligible for graduate membership of the Hong Kong Psychological Society (HKPS). 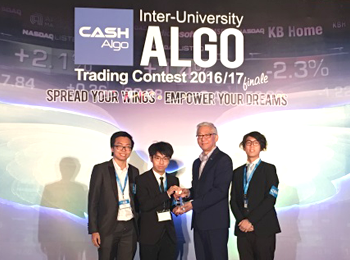 Thirteen renowned universities in Hong Kong and Mainland China were invited to join the Second Inter-University ALGO Trading Contest and more than 100 applications were received. The OUHK team won the 7th place in the Finale.